Now people tell me they aren’t gin drinkers. Neither was I. The well gin or even Bombay Sapphire that are the only available choices at most bars tastes like a mouthful of Pine Sol to the uninitiated (and for the uninitiated, that flavor comes from the juniper berries that are a key ingredient in gin). But there are several varieties of gin that I have come to love. Plymouth Gin is smooth and virtually tasteless. Much like vodka, which is so popular in mixed drinks for its lack of flavor, Plymouth is a great mixer gin. Boodles, another British export, has a much subtler juniper flavor than Bombay. The bottle is very stuffy and British looking, which seems appropriate for gin. Drinking a gin martini or a gin and tonic makes me want to break into Gilbert and Sullivan. Both Plymouth and Boodles are mixers for drinks. They are definitely gin, but not overpowering or with a strong taste of their own. Rangpur makes a lovely gin martini or gin and tonic. But my favorite (and one of the priciest) is Hendricks. 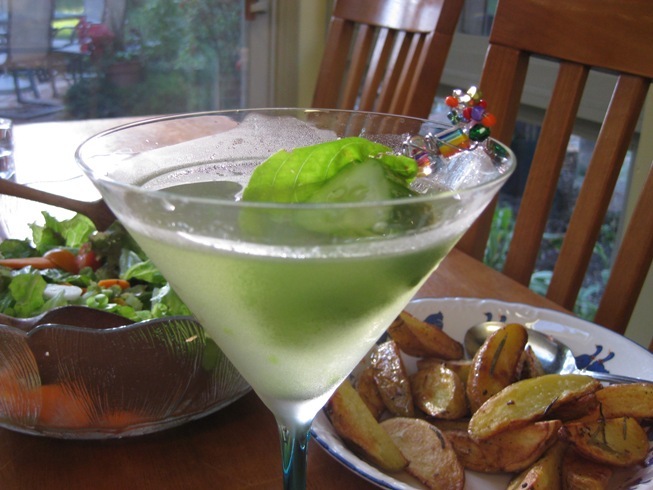 Hendricks has a distinctive cucumber flavor, that is very different in a gin martini. I’ve had a Hendricks martini at some upscale bars/restaurants, but maybe half the time they have cucumbers to garnish. Lois made the following last year, and with the basil being plentiful, we’ve revisited this lovely cocktail again this summer. Shake well, strain into chilled martini glass. Garnish with cucumber slice and basil leaf on a pick. Drink immediately.